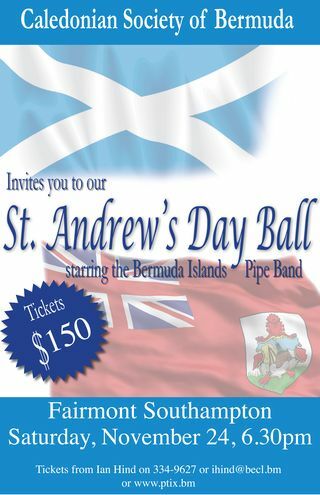 It’s almost time for The Caledonian Society of Bermuda’s St. Andrew’s Ball 2012! The Ball will take place at the Fairmont Southampton on Saturday, November 24th and you do NOT need to be Scottish to attend – you just have to enjoy good food, good company, drinking, dancing or any combination of those. The event kicks off with a cocktail reception (cash bar) from 6.30pm until 7.30pm. We are seated at 8pm for dinner, served after the Grand March and MC’s welcome. The four-course dinner with wine will be followed by the ceilidh portion of the evening (Scottish dancing, pronounced kay-lee), with live music from the Bermuda Islands Pipe Band, and then you can dance the night away until 2am with DJ King Arthur. Don’t worry if you don’t know the moves! There will be a free practice run at the Police Recreation Club, near Cedarbridge Academy in Devonshire, on the Wednesday before the Ball (November 21st from 7pm until 9.30pm) to show you the basics. The practice run is a great night out in itself but, even if you miss that, you will be able to pick it up easily on the night. Any of you who have been before can testify that it’s not that complicated – after all, these dances were originally designed for drunken Scottish people to be able to do! Dress code is black tie and tickets are $150 each, including everything but additional drinks. Tickets can be purchased for individuals, couples or whole tables (tables are either for 10 or 12 people). Ian Hind will be coordinating the seating arrangements – please contact him at IHind@becl.bm and arrange a bank transfer or meet him with the cash/cheque to collect your tickets, otherwise you can pay online at www.ptix.bm. Whichever way you choose, make sure you get your ticket for what is sure to be The Caledonian Society of Bermuda’s biggest and best event yet!